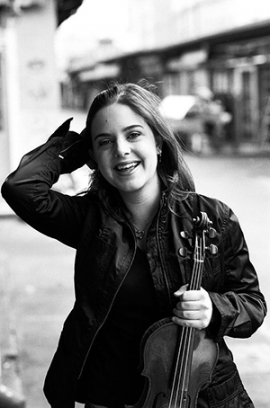 Internationally recognized as a soloist as well as a chamber musician, Austro-Italian violinist Olivia De Prato has been described as “flamboyant…convincing” (New York Times) and an “enchanting violinist” (Messaggero Veneto, Italy). After recently moving to New York City she has quickly established herself as a passionate performer of contemporary and improvised music. Her chamber music activities include appearances at the Bang on a Can Marathon in NYC, the Lucerne Festival with Pierre Boulez, the Ensemble Modern Festival, “June in Buffalo” and the Ojai Festival with Steve Reich. Olivia is a member of the new music ensembles Signal directed by Brad Lubman and Victoire founded by composer Missy Mazzoli. Olivia has closely collaborated with composers such as Sir Harrison Birtwistle, Pierre Boulez, Chaya Czernowin, Peter Eötvös, Michael Gordon, Helmut Lachenman, David Lang, Meredith Monk, Steve Reich, Todd Reynolds, Ned Rothenberg, Julia Wolfe, and Evan Ziporyn. Olivia studied at the University of Music and Arts in Vienna and received her BM from the Eastman School of Music. She graduated with her MM in Contemporary Performance from the Manhattan School of Music.